Everyone likes to be recognised for excelling at what they achieve in their chosen career and that’s no different for restaurateurs and chefs. 17 of Appetite4Recruitment’s clients made up a substantial proportion of this year’s Good Food Guide Award winners and we send out congratulations to all of you. What is the Good Food Guide? 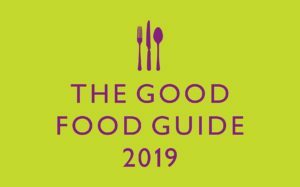 The Good Food Guide is a trusted guide detailing what its critics believe are the best restaurants and bistros in the country. Established in 1951, the guide is there to tell its readers where they can find the very best food that Great Britain can offer. All of the reviews are based on substantial feedback they receive direct from the public together with the opinions of their own inspectors’ hands-on experiences. What are The Good Food Guide Awards? The Good Food Guide Awards are an annual award that celebrate the year’s finest chefs, restaurants, and up-and-comers. Both individuals and restaurants are eligible for awards and, at the same time the award nominees are announced, a list of the 50 top-rated restaurants in the country is released to the industry and to the press. How did Appetite4Recruitment’s clients do in the awards? Winner of the 2015 “Chef To Watch Award”, Gareth was crowned Chef Of The Year for 2019. His restaurant climbed seven places to reach number 5 on the best restaurants list too. His use of Welsh seasonal ingredients in his creations has captured the attention of the guide twice and his technical skill and focus on flavour continues to propel his career forward. L’Enclume, the 2 Michelin-star and 5 AA Rosette winner from acclaimed chef Simon Rogan, finished in second place for the second year in a row. In the 2018 Good Food Guide, the restaurant was awarded 10 out of 10 for the sixth year in succession. Simon uses ingredients taken from the grounds surrounding L’Enclume including vegetables, flowers, fruits, herbs, and other foraged ingredients which he then uses in his “technically (brilliant)” cooking. Another 2 Michelin-star and 5 AA Rosette winner, Restaurant Sat Bains, banquet winner on the Great British Menu TV show, finished 4th in this year’s Good Food Guide Awards poll. We understand that there is more to a restaurant than food and service. Excellence in both is only possible when the kitchen and front of house work together as a team. For that to happen, top-quality restaurants need the right people and that’s what we at Appetite4Recruitment provide our clients with. Without a strong team which is given the space and the training to develop and grow together, many of these successful businesses would face many more challenges to reach the heights they have achieved. If you’re looking to take the next step in your culinary career, get in touch with our team. For more information, call us on 0203 301 2696 or email us at info@appetite4recruitment.co.uk.